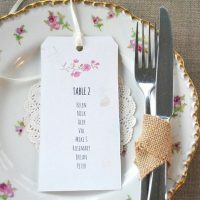 Categories: Vintage, Unique & Eco-Friendly Wedding Stationery, Wedding Invitations. This Blossom seed paper invite set is so pretty! The Blossom and the seed paper perfectly complement each other. The invitation is A5 in size and printed on paper made from recycled cotton and scattered generously with seeds. These seeds include Spurred Snapdragon, Daisy, Poppy, Black-eyed Susan and Sweet Alyssum, although this mix could vary if we need to use a different white seed paper. The invite comes with a recycled envelope. The planting instructions are printed at the bottom of the invite. Please advise the text details in the box above or by email after you have ordered. 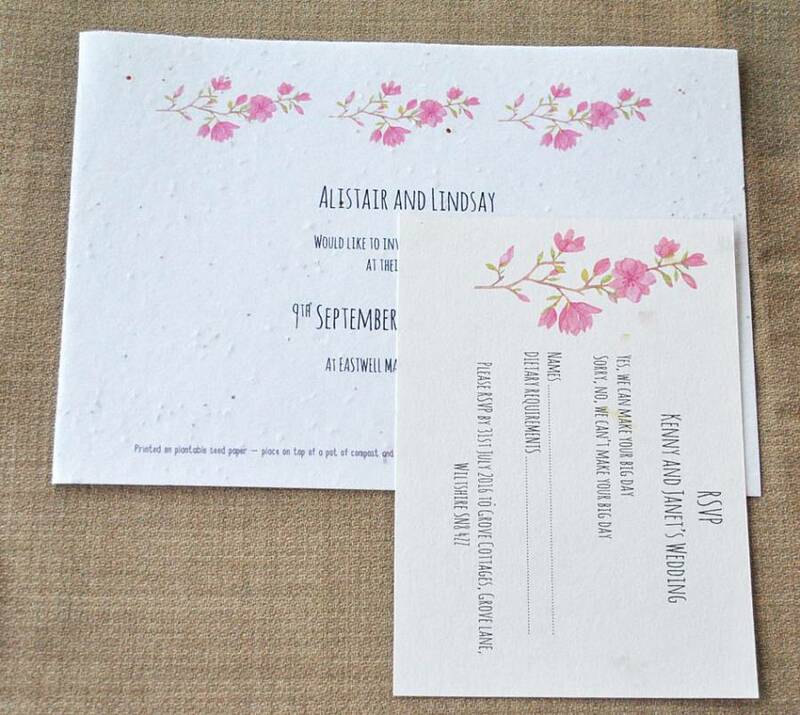 There is the option (above) to have the invites printed with or without guest names. If you wish guest names printed there is a small charge of 10p per invite – please email a list of names after ordering. 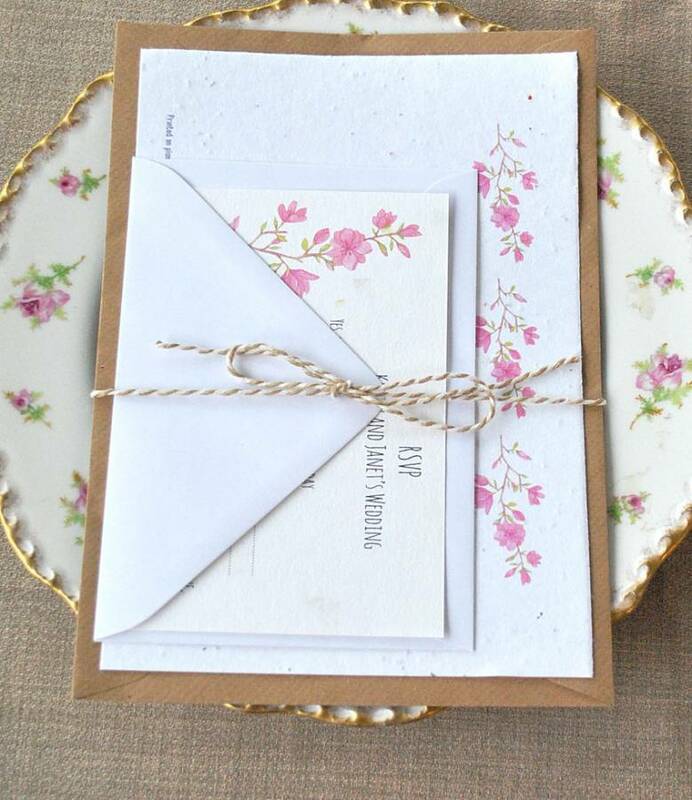 The RSVP is printed on quality recycled card that has petals here and there scattered throughout. It is A6 size and comes with a recycled envelope – manilla, ivory or pale grey, depending on envelope colour in stock when you order. This Blossom design seed paper invite set is part of our Blossom stationery and accessories range. 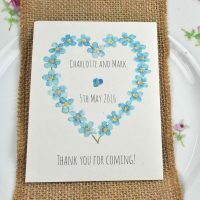 Also available are Save the Date card, Order of Service, table names, menus, table plan tags and place names and seed packet wedding favours. Also table confetti sprinkles and advice cards to match the theme! Plus we can also create for you anything else you need to match this design – just drop us an email! 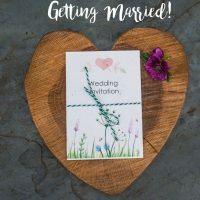 Simply place the invite on top of a pot of compost (preferably peat-free!) and water well. Spring and summer are the best times of year to do this so that you can have the flowers on show in your garden in the summer! Place somewhere warm and light to germinate and keep moist – it is vital to successful germination not to let the paper dry out! 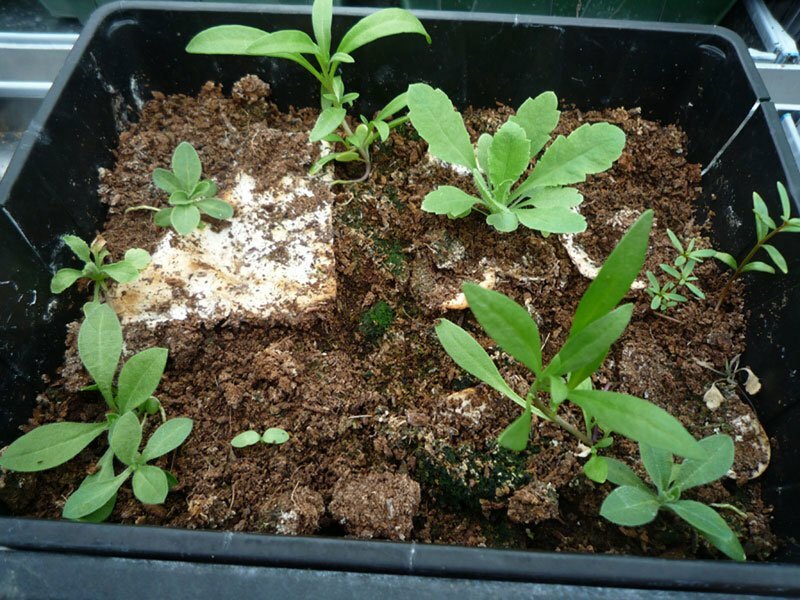 Once you have lots of seedlings, transplant the whole lot into a bigger pot and place on your patio in a sunny spot. We do not recommend planting the paper directly in the garden as there is the risk of slugs and mice eating the seeds/seedlings. The photos below show the flower seed paper germinating and flowering.